All transactions are safe and secure with a reliable history in online purchasing behind each of our associates. 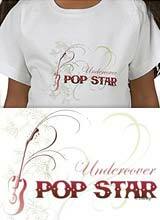 Buy the Undercover Pop Star t-shirt to own Hannah Montana clothing and merchandise. This designer style Undercover Pop Star t-shirt is both trendy and fashionable. It will have your friends trying to guess your secret celebrity identity. The design on these Hannah Montana t-shirts displays a rendering of a guitar to the left of the attractive text that reads, "Undercover Pop Star". Now you can play the role of Miley Stewart and experience the best of both worlds in this official piece of Hannah Montana merchandise. It's perfect to wear on your next girls night out. This Disney tee is available in both kids and adult sizes. Wear it with a Hannah Montana costume to become your favorite pop star. In addition to the Undercover Pop Star tee above, browse the Hannah Montana Clothing Gallery for more apparel like men's and women's clothes, kids shirts or hoodies.